One of my good friends is getting married this weekend, and it has me reminiscing about my own wedding. 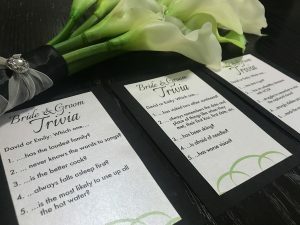 When she was planning her big day, she mentioned that something she remembered from my wedding was the bride and groom trivia cards on the tables. 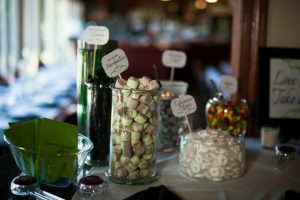 They were a great conversation starter among guests as everyone waiting for the meal to be served, and they were super easy (and practically free) to create. 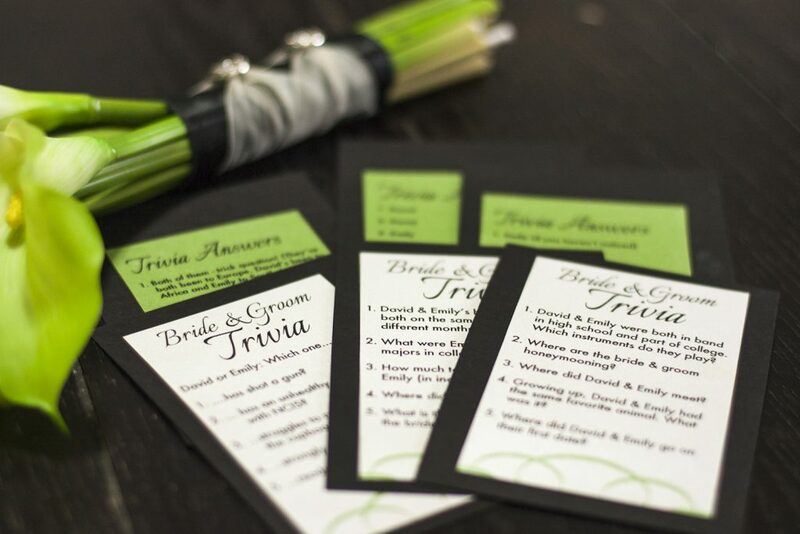 If you’re looking for easy wedding DIY projects that add a little something extra to your celebration without breaking the bank, these bride and groom trivia cards are a great project that can be whipped up at the last minute. 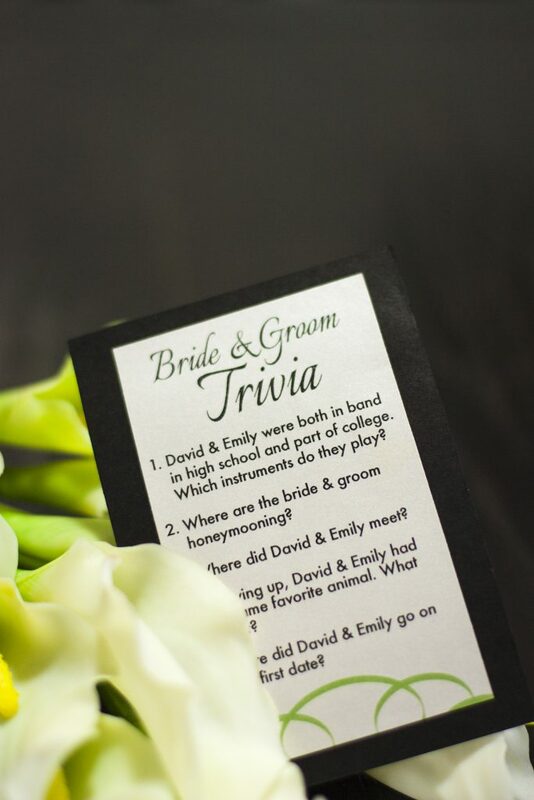 These DIY bride and groom trivia cards were super simple to make. 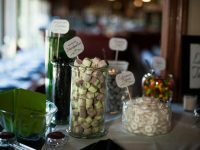 I whipped them up just a couple days before our wedding and they were a huge hit at our reception! 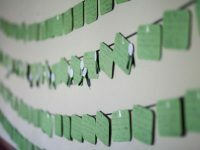 The most time-consuming part of this project is brainstorming trivia questions. 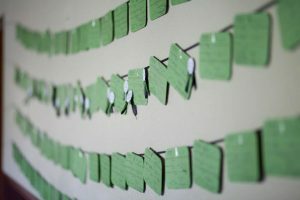 I came up with a list of 30 trivia questions which was enough to create a set of six trivia cards, with five questions on each. Your trivia questions can be anything you want them to be! 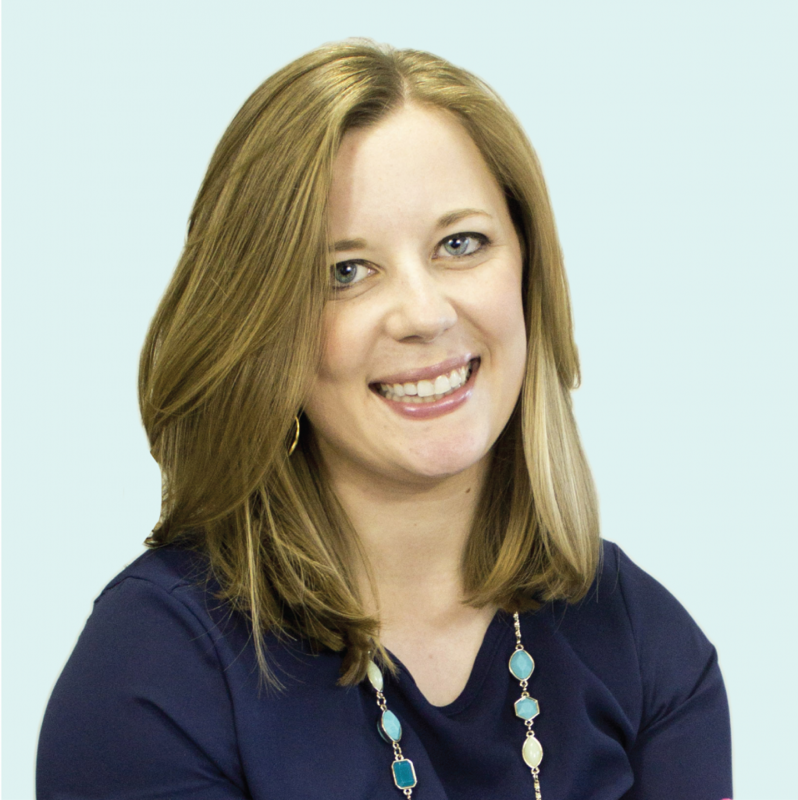 I included a variety of questions about our personalities and tried to keep them light-hearted so guests who didn’t know us well would still have fun. If you need inspiration, here are the questions I came up with. …never knows the words to songs? …is the most likely to use up all of the hot water? …has visited two other continents? …always remembers the date and place of things like when they met, their first kiss, first date, etc. …has an unhealthy obsession with NCIS? …struggles to remember to shut the cupboard doors? …is better at giving massages? …mixes mayo & ketchup for their french fries? …sets the fire alarm off the most? David and Emily were both in band in high school and part of college. Which instruments do they play? Where are the bride & groom honeymooning? Where did David & Emily meet? Growing up, David & Emily had the same favorite animal. What was it? Where did David & Emily go on their first date? David & Emily’s birthdays are both on the same day but in different months. When are they? What were Emily & David’s majors in college? How much taller is David than Emily (in inches)? 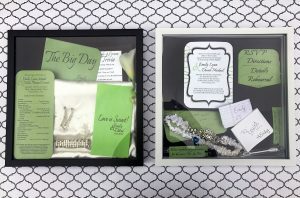 What is the first big purchase the bride & groom made together? Type your questions into a document and format them to fit small cards. My cards were 3×5 inches. 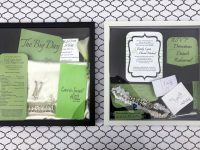 I used the green flourish and fonts from our invitations to tie things together. 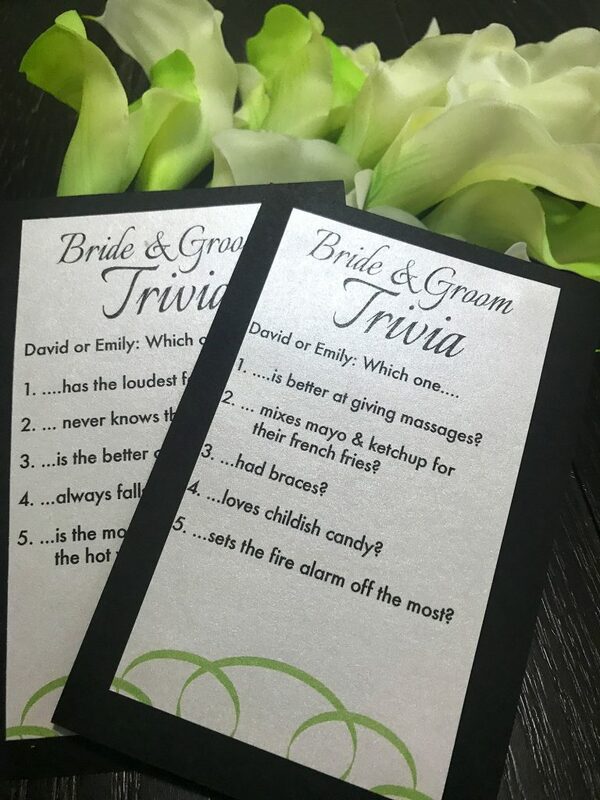 I printed our wedding invitations myself, so I printed the trivia on some leftover invitation paper. I printed the trivia questions on white paper and glued them onto black cardstock using a glue stick. 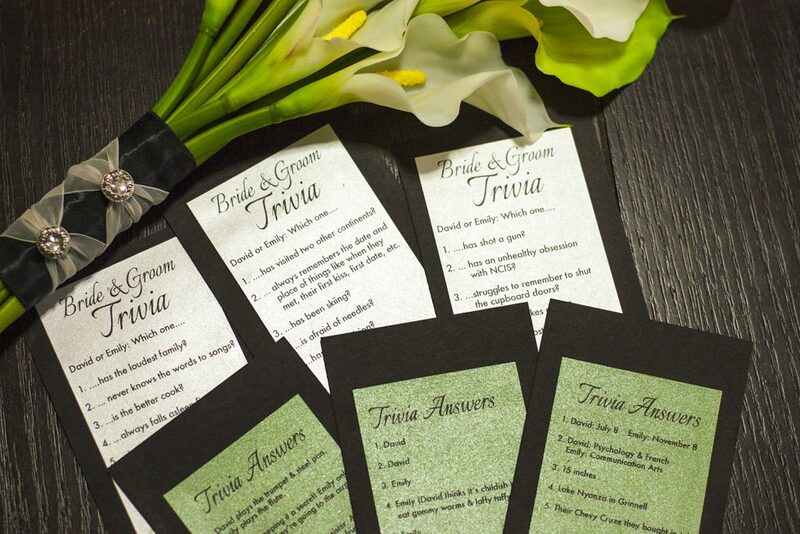 Then I printed the trivia answers on green paper and glued them on the back of each card. 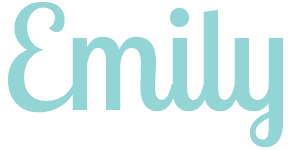 You can easily type your questions into a Word document and print them on regular paper or cardstock. This project didn’t cost me a cent because I used paper I already had! 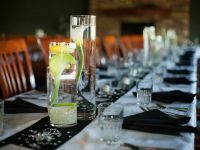 Thanks for visiting my blog today and allowing me to share a little slice of our wedding with you. It’s hard to believe this was four years ago! Since I didn’t have a blog then, I’m really enjoying this series. 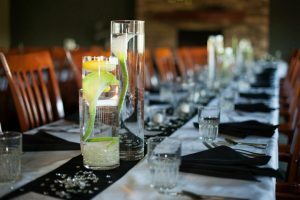 What are the coolest wedding DIYs you’ve seen?